I remember passing by a riverbank one day, where all the small wooden huts reside. I asked my friend how we can eliminate them. He simply responded, by erradicating poverty. So true. How? Education and SME development. I really truly believe those were the two things that will revive my country. Don’t ask me to give you the comprehensive logical argument on why I believe it, I just do. Education. No further argument needed. Small and medium enterprises. The majority of companies in Indonesia is considered to be a small or medium companies. The majority. Can you imagine if most of them grow? Can you imagine how strong the economy would be? Again, how to do that? The million dollar question. I will quote another friend when I asked him, “What can we do?” He said: just do what we can. Spot on, babe. You’re thinking too much. Stop thinking, start doing. What can we do? A lot of things. Look at the family of those who work for you. The office boy. The driver. The maid. The street hawker that pass by your house everyday. Do you have time to spare, skills to share? Volunteer. Support any type of social activities around you, whichever you are comfortable with, does not really matter. Do you like to write? Then for God’s sake start writing. Anywhere. Do you have money? Donate. Give up those four cups of Starbuck’s coffee a month and give the money to the needy instead. Be a true professional at what you do, whatever it may be. No corruption. No complaints. If you are a consultant, consult well. If you are a business planner, plan it well. If you are a teller, count well. You have a job? Consider yourself lucky. Smile and say hello to those who open the door for you, to those who clean up your desk, to those who take you to work, to those strangers whom you meet at the lift everyday. If you can’t do all the above, at least please do not make the condition any worse. The signs are everywhere. What are you waiting for? This entry was posted in macro on May 23, 2007 by Eva. Never ever "I don’t know"
“For you the hardest word to say is not “sorry”. It is “I don’t know”. Not sure whether to laugh or to be offended by it. Hits right between the eyes. The oh-so-familiar statements of “Sure, I know”, “Oh I know somebody who knows”, or “I am not sure, but let me find out”. Things I do to make my life more complicated. This entry was posted in personal, quote on May 15, 2007 by Eva. This entry was posted in quote on May 15, 2007 by Eva. These kind of people–people who actually dedicate their time, their life, for other people in need–have often put me to shame. And put my life back to perspective. 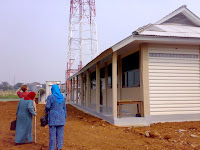 I have just visited a school managed by my mom’s friend, Ibu Su’dan. She and her late husband established the school in 1980 under the name Ittiqon Foundation for needy children in North Jakarta. They started with less than 10 students in old wooden house. They literally had to visit the houses in surrounding area and asked parents to let their children go to school. “What’s the use, they will end up being a garbage collector, like me,” they said. Twenty seven years have passed (My God, twenty seven years!). 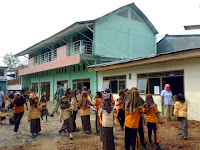 Now 800 elementary and junior high school students go to that school. For free. Some students who want to pay are a allowed to pay at will. Some students actually save their money to pay for the school as best as they can. Forty-two amazing noble people teach in the school, with ‘salary’ way below the minimum regional wage. They even cook for the students, if need be. The head of the school once stated that they were free to leave if they wanted to look for better job, but they said they liked it there. On rare occasions, the students receive milk, rice or even cheese bread. Ibu Sudan said that some never had tasted cheese before and they threw it away because they said it was salty. The milk gave them indigestion at first because they were not used to it. I was so proud to hear that a student from the school was in the top five best score for final exam among all students in North Jakarta. Some graduates from the school receive diploma scholarship from UIN Syarif Hidayatullah. Upon receiving the diploma, they return to the school and teach. A full beautiful cycle has been accomplished. Now the school has just finished building two more classes. They are about to receive support from an organization to build 15 more classes with . Yet there are a lot to be done. Weekly milk or some sort of nourishment. Book or educational tool supplies. Better wage for the teachers. Occasional bonuses for the teachers. And that these children will grow to be greater people, more than you or me. This entry was posted in friend, macro on May 5, 2007 by Eva.